A YOUNG Mornington woman who “always wanted to help people” is the first to enter a traineeship program at Mornington Peninsula CIU. Victoria Police launched the Aboriginal and Torres Strait Islander school-based traineeships in 2017 and the program is said to have “made great strides” since then. The program is designed for students completing years 10, 11 or 12 who are interested in a career with Victoria Police and is available at several police stations around the state. Ashcka Woods, 18, a Year 12 student at Mornington Secondary College, is completing the program as part of her Certificate III in Business. She is settling in at Somerville CIU, the first unit in the state to participate. 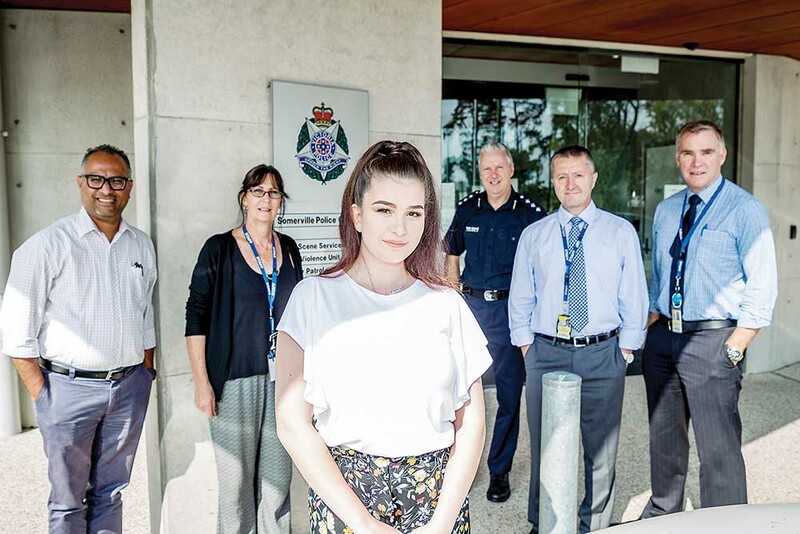 “The program gives young people insights into the organisation and an opportunity to learn and work at a local police station before they can find an employment pathway for themselves,” Detective Senior Sergeant Miro Majstorovic said. Ashcka describes herself as a “caring person”. “Since growing up I have always wanted to help people,” she said. “Working as a police officer would suit me because it is not just working in an office behind a desk – there are many different roles in which I could make a difference to other people’s lives. Ashcka hopes to become a uniformed officer before deciding on a specific pathway as her career develops. She said she was “settling in and getting comfortable” at Somerville with small tasks and computer work that align with her course. Her main goal is to finish school and complete a business diploma before becoming an officer and “sticking with it”. Ashcka said she was looking forward to working with another trainee at Frankston police station soon and, in July, doing a three-day live-in component at the Police Academy with 40 other trainees. Frankston police station currently hosts two people enrolled in the program. Anyone interested in applying for the program can visit the Skills Invest website.